Clouds are scudding into Vermont from upstate New York. Pretty, fluffy, white flakes are trickling down from them. By the time dawn approaches tomorrow there will be another 8 to 10-inches of fluffy white powder gracing ski slopes in Vermont. Add this to the several inches of snow received over the weekend, and things are looking pretty sweet in the mountains to our north. Such a nice recovery from the nasty rain only a week ago. All this means some pretty good conditions at Mount Snow in Vermont. And that’s where the Avie’s Ski / Sports trip is heading this Sunday, February 3rd. You could have the view in the image above, taken on the Bluebird Express to the summit at Mount Snow. Sure, it’s Super Bowl Sunday. And yes, the Patriots are playing. The lure to be there in front of the TV watching Tom Brady and the rest of that fabulous team work their magic is strong. Game time isn’t until 6:30PM. The Avie’s Ski / Sport bus will leave Mount Snow at 4:30PM. Almost sure to be back to Westerly by 8:00PM. Still plenty of game time left to go. Most if not all of the second half of the game will await your viewing pleasure. If you are one of the skiers or riders being dropped off in Waterford, you certainly will catch the second half of the game. 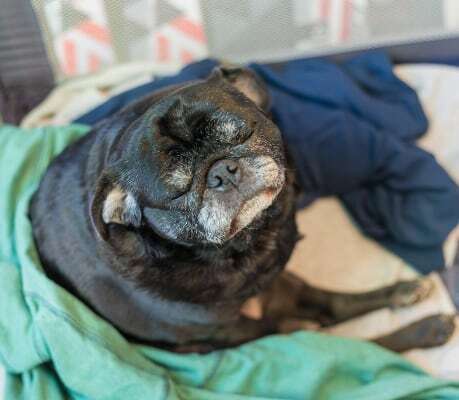 Why waste your entire Super Bowl Sunday sitting around doing nothing WAITING for the game to start? Go skiing and riding. 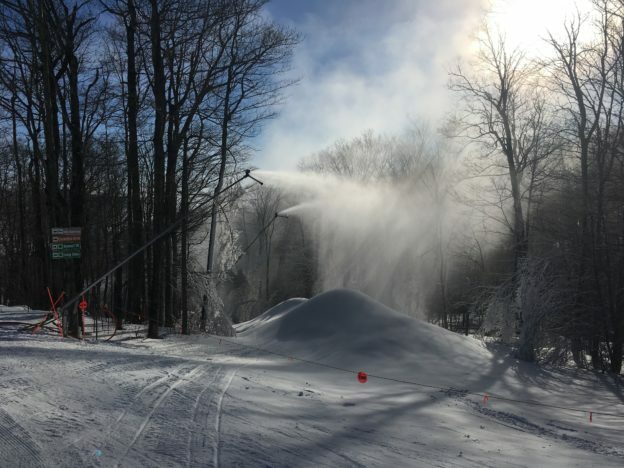 Get yourself to Mount Snow on the Avie’s Ski / Sports bus trip and make your Super Bowl Sunday a fun-filled, action packed, back-to-back thrills day. You try to focus on the second half of the Super Bowl, but can’t get the memories of such a great day of skiing and riding out of your head. Get signed up for this incredible trip to Mount Snow by end of the day this Thursday. $99.95 is a great price for a great day of skiing and riding. Followed by an evening watching the New England Patriots vie for yet another Super Bowl title. Hope to see you Sunday morning for the trip north. 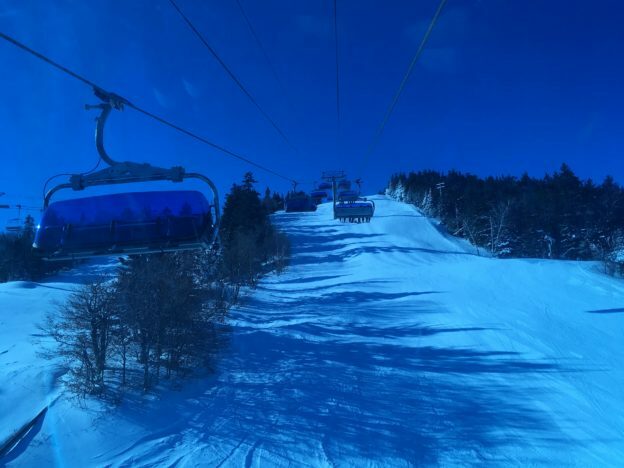 This entry was posted in Snow Conditions, Store Events and tagged bus trip, mount snow on January 29, 2019 by Alan Desbonnet. We have all been waiting for snow. And we got it. But unfortunately in a melted physical format. But no worries!! Up north they got snow. And lots of it. A foot and more of the wonderful white stuff fell on ski slopes all the way from New York to Maine. And we have been waiting for a few other things beside snow. Such as, snowboards from Capita, fluorocarbon wax from SWIX, and bus trips from Avie’s Ski / Sports. Capita snowboards have had a hard time getting to retail shops this season. But no longer. A shipment of Capita snowboards arrived at Avie’s Ski / Sports and are now available. If you have been waiting for Capita boards to arrive, wait no longer. And don’t wait too long because they probably won’t have a long shelf life. SWIX has been having some difficulty getting fluorocarbon waxes out of Norway, where they are produced, and into the US. The policy log jam finally opened up and we expected SWIX LF waxes to arrive mid-January. But the US government is not open for business, which means that the Environmental Protection Agency (EPA) can’t sign off on the permits that would allow the shipment to get to us eager New England ski and snowboard waxers. So we found an alternate source, and expect some low fluoro- ski wax to arrive early this week. What’s the big deal? If you wax your own skis or snowboards, low fluoro- wax is the “go to” wax for New England conditions. New England snow is typically high in moisture content, and low fluoro- wax significantly improves glide in high humidity snow. Never used a fluoro- wax? You should. As soon as you make the switch you will notice that your skis, or snowboard, want “to go” is the only way to describe it. And then of course there are ski and ride bus trips hosted by Avie’s Ski / Sports. Next on tap is a trip to the great state of New Hampshire to ski and ride at Loon. Great price of $99.95 per person, which includes round trip travel on a coach bus and your lift ticket at Loon. To best ensure that the trip runs to Loon, sign up before mid-afternoon on Thursday of this week. Avie’s needs to commit to bus and driver Thursday afternoon, and if there are not enough people signed up to go, the trip will be cancelled. You can of course get on the trip if you sign up after Thursday. But you might be disappointed to find out there is nothing to sign up for because the trip was cancelled due to lack of interest. That’s a shame. 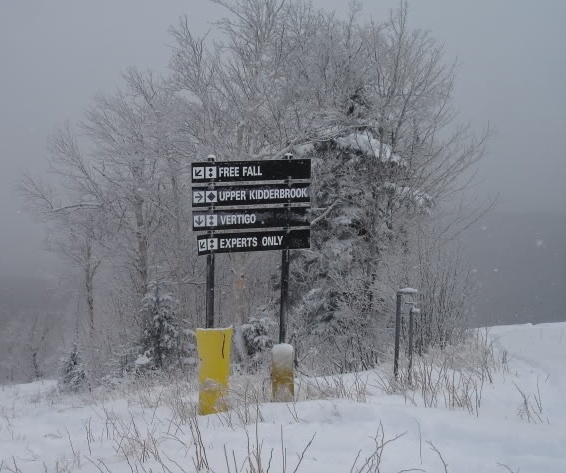 If you are interested in skiing or riding at Loon, sign up earlier than later. On Wednesday, January 30th, the first Avie’s Ski / Sports mid-week ski and ride trip heads to Okemo in Vermont. Do you want a day on the slopes where you can rip up the trails top-to-bottom without crowds? Do you want a day skiing or riding from top-to-bottom and going directly onto the lift back to the top? If you answered YES to either (or both) then you MUST be on the Wednesday trip to Okemo. Be sure to sign up for the Wednesday January 30 trip to Okemo by mid-day on Monday the 28th so we can ensure the trip runs. New snow, snowboards, and wax. And some new ski and ride trips ready to bring you someplace fun. So you can play on the new snow with your new snowboard which is slicked up with new wax. Sounds good to me. See you there. This entry was posted in Snow Conditions, Store Events and tagged bus trip on January 21, 2019 by Alan Desbonnet. The group from Avie’s Ski / Sports had a blast at Stratton on the January 13th trip north. Conditions were phenomenal. Temperatures stayed in the high teens, but without a breath of wind. Great temps for skiing and riding. And the sky. Such a beautiful sky. Not a cloud to be seen anywhere. The only thing resembling a cloud were the snow-capped peaks of the Presidential Range in New Hampshire off in the distance to the east. Ok, great weather. How were conditions? Incredibly good. Most of the mountain was open, and most open trails were groomed. With no wind, the snow stayed on the trails. The only spot that got a bit nasty in the afternoon was Janeway Junction. Too much traffic always seems to make that spot get scraped to glacier status. But if you avoided that, the rest of the slopes were firm, fast, and snow covered. The new lift in the Snow Bowl area of the resort is a fantastic addition. The trip back to the summit from the bottom of World Cup now takes about 5 minutes rather than the 15 or so minutes with the previous lift. Better still, few seemed to know it was there because there was never a line. So, you could avoid the long, slow runout back to the base area with a short hop back to the summit. Very nice addition. Even more surprising were the crowds. Or lack thereof. Yes, it was busy, but the longest wait I had was at the Sunrise Express lift out of the Sun Bowl, where it took about 5 minutes to get on the lift. So there were fewer people on the trails than what I think of as “normal” for a Sunday. And once the Patriot’s game started, the trails got even more lonely. For those that decided to forgo at least the start of the game, the skiing and riding throughout the afternoon was spectacular. Starting to get the idea it was a great day? It was. 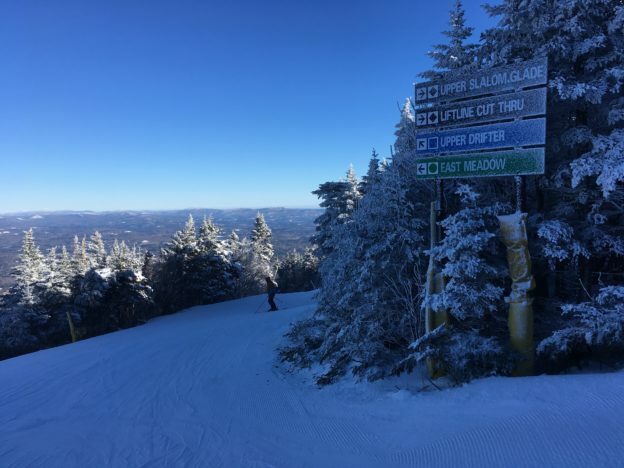 Personally, I thought the snow in the Sun Bowl area was the best, and my favorite trails for the day were Sunrise Super Trail, skiers left as you get off the Sunrise Express chair, and Lower Downeaster, skiers right coming off the chair. Right at the end of the day, the Sunrise Express lift in the Sun Bowl experienced problems and was shut down for repairs. Fortunately they got everyone off before shutting it down. This left the Solstice lift running, which I hadn’t been on before. It is a sloooooooow lift, but when it’s the only lift, you take it. Fortunately I took it only once, for my last run of the day. 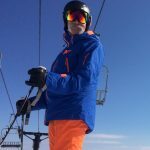 I took Big Ben, a novice trail right off the Solstice lift, back to the Sun Bowl lodge. It’s a scenic, winding trail through the woods, experiencing a gentle grade. It pops out of the woods at the top of a big, broad slope leading past the tubing hill. The sun had been on the slope earlier in the day, which was now in the shadows as the sun was setting. I tipped over the top of the long wide slope, quickly finding out that the sun must have slightly thawed the surface, which then froze over as the sun dipped behind the mountain. For a novice trail, I had a fast ride down the slope back to the lodge. Big carves across the face of the trail, all the way to the bottom, was a fantastic way to end the day. I was tempted to jump on the lift for one more spin down Big Ben, but opted not. My quads were screaming from a fun afternoon of torture. I decided to let it end on a high note. My quads were very grateful for that decision. The bus ride back to Westerly was particularly quiet. Everyone was what I call “blissfully exhausted” from a fun day on the snow. 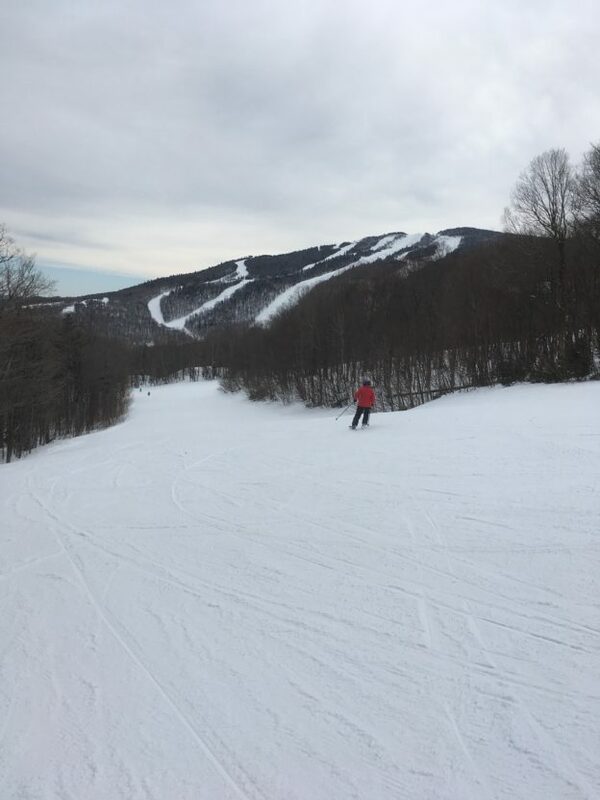 This coming Sunday, the 20th of January, the Avie’s Ski / Sports trip heads back to Vermont to visit the slopes at Mount Snow. Same great price of $99.95. Be sure to sign up by early afternoon on Thursday the 17th to help ensure that the trip will run. Sure, you can still sign up for the trip after Thursday. But you run a risk of two very bad things happening. First—too many people waited until after Thursday afternoon to sign up, and the trip was cancelled because we thought there wasn’t enough interest. Second—too many people did sign up before Thursday afternoon and there are no seats left on the bus. In the first case, everyone loses. In the second, there is a big number of winners, and one loser. Following Mount Snow Avie’s heads to Loon in New Hampshire on the 27th. On January 30th, a Wednesday, Avie’s Ski / Sports has the first mid-week trip of the season, heading to Okemo. I urge you to be on that bus. Mid-week skiing and riding cannot be beat. Sign up for this trip early so that we know there is enough interest. Check out the full trip list. This entry was posted in Snow Conditions, Store Events and tagged bus trip, Stratton on January 14, 2019 by Alan Desbonnet. Vermont and New Hampshire are getting whacked with a nice blanket of that fluffy white stuff we call snow. This weekend—Sunday specifically—you can be at Stratton on January 13th. The 5 to 7-inches of snow, maybe more locally on the mountain, will freshen things up quite nicely for our skiing and riding pleasures. Stratton is a fun mountain, with a variety of terrain for all ages and abilities. A brand new lift over in the Snow Bowl will give another opportunity to get to the summit without returning to the base village. The best part of the trip, sponsored by Avie’s Ski / Sports in Westerly, Rhode Island, is the price. That price includes a ride to and from Stratton, on a comfy coach bus. Get on the bus in the morning and relax for a few hours as someone else does the driving. Get to Stratton and ski and ride all day long. Get on the bus at the end of the day, exhausted from so much fun, and let someone else do the driving. The price includes your lift ticket cost. 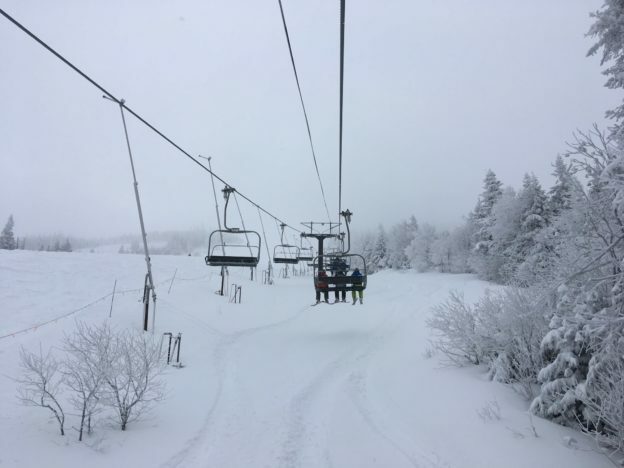 If you were to drive all the way to Stratton on your own, then go to the ticket window and get your lift pass, you would experience at least three unpleasant things. First, you would have driven all that way to Stratton early in the morning instead of relaxing with friends and family. Second, you would pay MORE for the lift ticket than for the entire Avie’s Ski / Sports cost of the trip. Third, at the end of the day, tired and crabby from paying full price for a lift ticket, you have to drive all the way back home. So, don’t go on the Avie’s Ski / Sports bus trip this Sunday, January 13th, to Stratton. Then you get the pleasure of driving 6 hours AND paying MORE for your lift ticket than if you joined the folks leaving from Avie’s. That sounds like a great deal for YOU. But not for me. I will be on that bus leaving Avie’s Ski / Sports and headed to Stratton. Decision to confirm the bus and driver for the trip to Stratton must be made by mid-afternoon Thursday. That’s tomorrow. Tomorrow afternoon. If you want to go on this trip, you need to have your reservations in place before mid-afternoon tomorrow. If too few are signed up to go, then the trip gets canceled. That would be a sad thing. Sad indeed. I look forward to seeing you Sunday morning at Avie’s Ski / Sports. Stratton awaits us!! This entry was posted in Snow Conditions, Store Events and tagged bus trip, Stratton on January 9, 2019 by Alan Desbonnet. 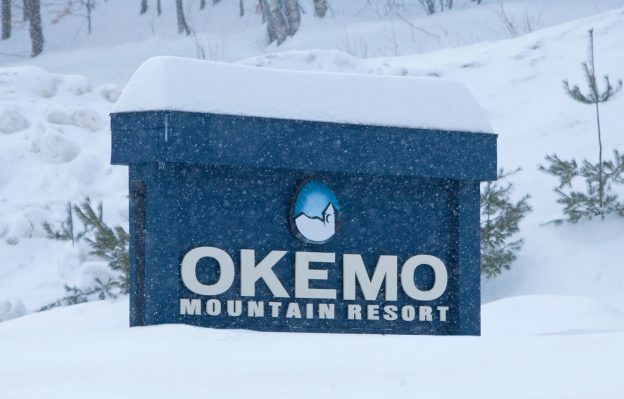 Looks like the first Ski & Ride trip, headed to Okemo, is a no go for this Sunday. That’s a bummer because conditions are getting increasingly good. Yeah, we had a few flip-flops into some spells of nasty warmer conditions. Look at the picture above? What do you see? You see “snow whales.” These are gigantic mounds of snow that the mountain ops snow makers create. They close trails and make snow whales. Then they push that mountain of snow around to make nice conditions to ski and ride on. That’s whats been going on up north the past few weeks. We have a return to cold on tap. And some fresh snow has fallen up in the north country. With more predicted in the days to come. Granted, no major dumps in sight. But they will come. No doubt about that. They just never happen soon enough or often enough for us snow hounds. Ski conditions are good and getting better. So all of us should be chomping at the bit, as the saying goes, to get out on the hill and let gravity have some fun with us. I know I am. But I don’t get to feed that need at Okemo this Sunday on an Avie’s Ski & Ride Trip. And that’s a bummer. An Avie’s Ski / Sport Ski & Ride Trip is always fun. And cost effective. The price of a trip, which includes the ride—on a coach bus—to and from the ski area AND the full day lift ticket, costs less than the price of the lift ticket for the day at the resort. Participants have nothing to do except chill on the way up. Ski and ride like banshees until the bull-wheels stop spinning and the lifties wave you away. Chill on the return trip and take in a movie or two. The thing is that decisions on “trip go or no-go” have to be made by Thursday mid afternoon. The bus company needs to confirm use of the bus and driver for the day. If, as seems to be the case sometimes, everyone thinking about going on the trip waits until Friday or Saturday, it’s too late. The sad decision to cancel the trip has already been made. Days earlier. Owen, after hearing the trip was off. Ted gets sad. I get sad. Owen gets sad and depressed. People walking in with big smiles on their faces ready to sign up for the trip Friday evening and Saturday morning leave with frowns. That’s a bummer. If you are considering participation in an Avie’s Ski / Sports Ski & Ride Bus Trip, then you need to get to the store and commit to the trip before mid-day on Thursday. I figured this was worth saying because hey, how would you know otherwise? Next trip up north on bus from Avie’s Ski / Sports takes place on Sunday, January 13th. This trip goes to Stratton. If you are interested in this one, and you should be, get to Avie’s and sign up. Do it now. Or tomorrow. Maybe even wait until Monday. But don’t wait until the last minute. Though if you do, that last minute should be Thursday the 10th at noon. Share this far and wide. Especially with friends and family you know who do take part in the Ski & Ride trips from Avie’s Ski / Sports. I hope to see you Sunday the 13th as we head to Vermont together to ski and ride at Stratton. This entry was posted in Snow Conditions, Store Events and tagged bus trip on January 4, 2019 by Alan Desbonnet.